The weather channel reported 6-inches of snow on the Mammoth Mountain in our very own Southern California, today! Which means that the ski season is here in Northern hemisphere and everyone is looking for deals on ski lifts and resorts. That’s where Liftopia comes into action – the startup gives you steep discounts on ski tickets and other snow-related activities. They have just added a new feature: full-mountain rentals. Which means you can keep the slopes to yourself if you’re willing to spend enough cash, or, if you wanted to go with a more pragmatic route, you could bring 249 friends or coworkers along with you. Depending on the resort, you’ll be able to rent an entire mountain beginning at $3,000. And if you don’t need to accommodate so many people, some resorts will let you rent out portions thereof (one venue will even let you rent a dedicated tubing hill). Liftopia is positioning the feature as a great idea for company off-sites or club snow days, which probably make more sense than my lone pizza-wedger fantasy. 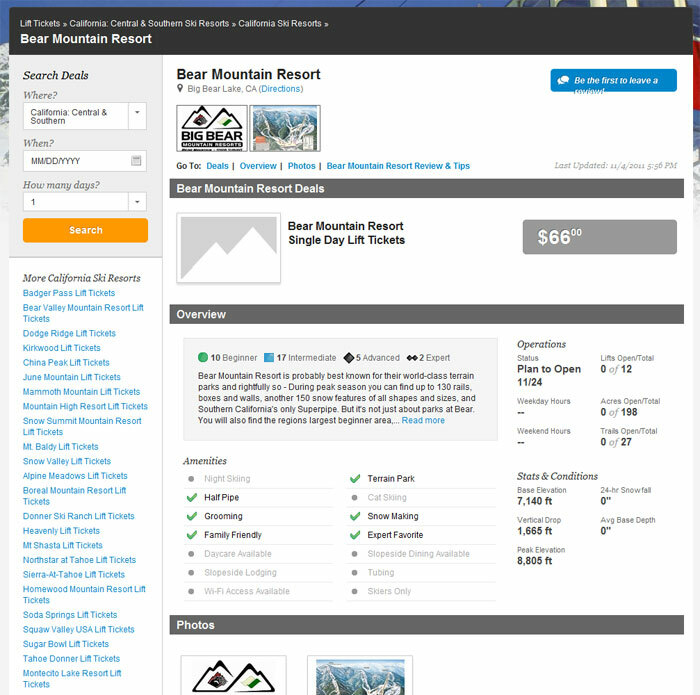 Liftopia lets you order ski lift tickets ahead of time online, often with steep discounts (you can save up to 80% off the walk-up ticket fees at some resorts). It’s a largely win-win situation: consumers save money, and resorts can adjust their prices to suit demand, so they have fewer off-days.